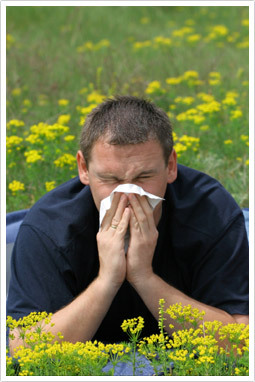 Spring is often thought of as the time for allergies, but really any change of season can trigger allergies and asthma. But what is it about moving into autumn that gets you itching and sneezing? For many people a drop in the temperature is enough of a trigger, and when the humidity drops the air becomes drier and is more likely to irritate a sensitive respiratory system. You may be bringing winter clothes out of storage in moth balls and dust is being stirred up. All of these and more could trigger your allergies or asthma. In our practice we have been investigating new natural solutions to provide greater relief from allergy symptoms than ever before. Allergies are Nothing to Sneeze at! While allergy and asthma appear to be caused by outside triggers, such as dust, pollen, dry air and stressful events, the underlying problem actually lies within us. Both allergy and asthma occur when a particular part of our immune system is out of balance. Our immune system is designed to protect us from infections and to keep us healthy. Allergy occurs when your immune system mistakes something that is normally harmless as being a threat to you and while “protecting” you from it, creates a strong inflammatory response. This inflammatory response is what produces the symptoms that you experience as allergy. In asthma this inflammation presents as difficulty breathing or may trigger an asthma attack. So whether you need help with occasional hayfever or suffer with persistent asthma or irritating dermatitis, we have the formula to help you. As your Healthcare Professional MNMC have the experience and skills to prescribe the most suitable treatment for your needs and help you to understand how to achieve your health potential. Call today to make an appointment to review your immune health and discuss what can be done to keep you in top shape. So whether you need help with occasional hayfever or suffer with persistent asthma or irritating dermatitis, we have the formula to help you. Our highly qualified Naturopaths have the experience and skills to prescribe the most suitable treatment for your needs and help you to understand how to achieve your health potential. Take a proactive approach and call MNMC today. You can make an appointment online, email us, or phone us on (03) 96862566. Our clinic in 49 Chetwynd St, North Melbourne, is open six days a week.